to our homeowners. We do this by making ENERGY STAR a standard feature in all of our manufactured homes allowing you to enjoy significantly lower heating and cooling bills at no additional cost. Rest assured that any home you order is going to be an Energy Star Home! Click on one of the series below to find your dream home! 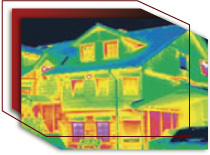 As shown in the above diagram, heat and cooling loss occurs throughout most homes. Kit homes are thermally insulated to keep in heat during the winter and cool air during the summer. The solid, tightly sealed construction of a Kit ENERGY STAR® home ensures maximized savings over a lifetime. Tight Construction -- Tighter home construction will improve the energy efficiency, air quality, and comfort of your home by eliminating unwanted drafts. Using sealant and vapor barriers create a comfort zone in your home. Low Escape Air Ducts -- UL listed tapes and duct mastic are used to seal all joints and seams in the ductwork. All Kit Homes are built using premium mastic sealer. Increased Insulation -- Increased insulation keeps out excessive heat and cold while maintaining even temperatures inside the home. A programmable thermostat ensures even heating and cooling. High Performance Windows -- Double-glazed low "e" windows carry the ENERGY STAR® label and save up to 30% in heating and cooling loss. Stop by our lot and see the Beautiful Energy efficient Kit Manufactured Homes. Copyright© 2002-2017 S & H Manufactured Homes Inc.